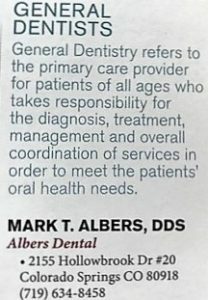 Dr. Albers Named a 2018 Top Dentist - Mark T. Albers, D.D.S. 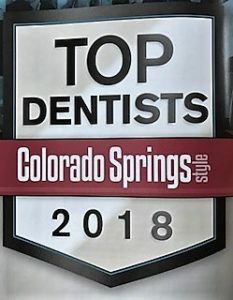 Once again, Colorado Springs Style recognizes Dr. Albers as a top general dentist in its 2018 Top Dentist survey. Dr. Albers spends over 100 hours each year participating in study groups or continuing education classes. He does this because he wants to provide the best dental care possible for his patients. His commitment to improving his dental skills and knowledge is an important part of how he practices dentistry. For this reason, Dr. Albers appreciates the vote of confidence from his dental peers, and is honored to be included in this list.